We purchased for price adjustment. In particular, it's good enough and not bad enough to be functional and reliable. I think about the purchase again when adjusting it because it is a necessary item. This review is about item#32592481. I like it more difficult to peel off than colored wraps. The 45 cm width is just right for putting on a large container for business use. When I'm finished using it and throw away the box, it's hard to take off the teeth and I'm going to cut my hand. This review is about item#32592472. There is no goodness of use of cradle, but it is satisfactory. This review is about item#35121913. I use it to keep the freshness of food at a store. It is used for warming foods such as various generated foods and ranges in order to keep the freshness of food at shops but it can be used without problems. This review is about item#89296952. It is rich in size and easy to use. I always bought this. This review is about item#32592445. Even if it says rap, it is various, but the hitachi wrap is not too thin, not too thin, I feel that flexibility, adhesion to dishes and containers is just right, the easiest to use. The sharpness of the blade is not good when cutting the lap. I think that it is better to make it a more minor blade. This review is about item#35121922. It is a thin, supple and supple lap so it does not blush well with the skin. Just because the price is too high compared to ordinary supermarket and business store, star 2. This review is about item#32592463. It is thin and durable, so I am satisfied because I can not use it even if I use a lot. I am using it for dividing ingredients at the time of making oak. Unlike other goods, work is fast because it does not stick to other (eg dishes). This review is about item#35121904. Regarding refilling 30 cm, the previous one was cheap to withdraw, but things purchased this year entered a break from the way and it was hard to use. Though it is a small thing, the thing which the package purchased before the green one was not cut. I am very satisfied with the usability. Because it is 100 m, it is useful for wrapping small plates and so on. But, the appearance container feels a bit delicate. It is very convenient because it can be used for wasteful storage of small containers. The wrap itself is very stretchy and has better texture than other laps. It is a feeling that blade handling is not easy to use conveniently. It is good to seal the cabbage and Chinese cabbage and arrange it at the shop front. When vegetables are sealed, sanitary · preservation also lasts long · looks good. Adhesiveness is bad when sealing. Is there any good machine? This review is about item#1199187. 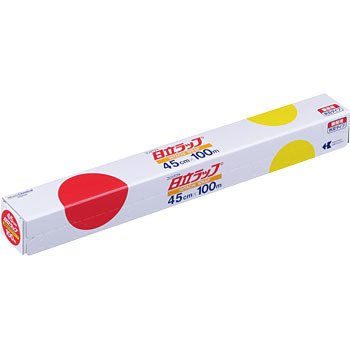 It stretches easily and sticks well so it is easy to use. It is a repeat purchase because it sells nearer and the price is also cheap. This review is about item#32592454. Anyway, cheap and good. It is a consumable item, even if it is used, there is no problem. Dia wrap eco quite right!